Good Eggs places colorful egg machines throughout communities, dispensing messages of Good Deeds to perform. Do you have a Good Eggs, good deed idea? Submit today and we may print and include new batches of Good Eggs! Over-the-Rhine is a neighborhood in Cincinnati. Historically, Over-the-Rhine has been a working-class neighborhood. It is also believed to be the largest, most intact urban historic district in the United States. 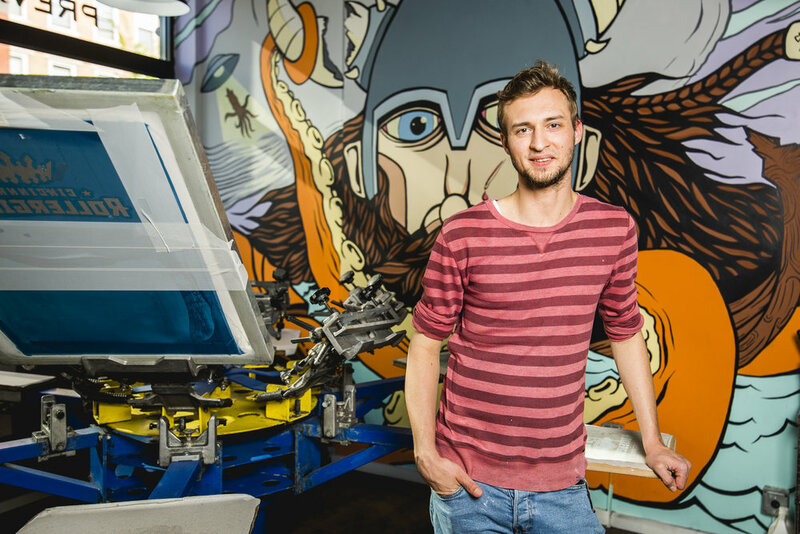 Matt Dorman, Print Manager of We Have Become Vikings, is making sure every print job is done right with his scrupulous little eyes. Matt is a graduate of Northern Kentucky University’s Fine Art program in printmaking. He has almost a decade of commercial print experience under his belt. Matt enjoys true crime podcasts, Doritos, frozen pizzas and hulking-out in his shorts while printing. We Have Become Vikings (WHBV), is a creative shop based in Cincinnati’s Over-the-Rhine neighborhood. We move across all media channels in order to deliver design solutions and create culture through innovation and work. We combine ideation with design thinking to create unique amazement and wonder that exceed expectations. Our deliverables include design, print, illustration, digital, interactive, websites, Audio and Visual apps, VR/AR prototypes and various brand development and marketing assets. What makes WHBV so different in the creative community is not only our incredible body of work but also our expertise in both print and digital. We are huge fans of working with our neighbors and creating culture in our backyard. People’s Liberty is a philanthropic lab that brings together civic minded talent to address challenges and uncover opportunities to accelerate the positive transformation of Greater Cincinnati. The Over-the-Rhine Chamber of Commerce represents its members by promoting economic vitality and fostering a socially and culturally diverse Over-the-Rhine community. We accomplish this mission through initiatives around marketing, communications and signature events, business attraction and retention efforts, and safety initiatives. The OTR Chamber was formed in 1985 as a 501(c)(6) organization. It created the OTR Revitalization Corporation, a 501(c)(3), in 2000 to tap into the grants and fiscal gifts available. The organizations work hand in hand to bring resources, events, commerce and awareness to the 360-acre neighborhood. Good Eggs look like an every-day gumball machines, but dispense eggs containing messages instructing patrons to commit a simple good deed. A good deed can go a long way to improve morale throughout a community, and so Good Eggs is designed so that it can be easily replicable in any community setting. Good Eggs was the first recipient of People’s Liberty’s Globe grant, and debuted in collaboration with the opening of the People’s Liberty office in Over-the-Rhine in 2015. We had a bunch of help in 2015 to get it moving - The Art Academy of Cincinnati with space and helping hens, We Have Become Vikings for design and print, friends and family, we cannot thank you enough! Now Good Eggs is flying the coop! Throughout Summer/Fall 2017, Good Eggs machines will be found throughout Cincinnati’s neighborhoods. By prompting the performance of good deeds, Good Eggs hopes to spread good will throughout the city. We love to hear your stories about carrying out Good Eggs’ deeds. Tell us your story!